Weight: 0.22 ct; size: 4.29 | 4.20 | 2.22 mm; shape: cushion triangle; colour: light orangey yellow; strong; clarity: eye clean; cut: very good; treatment: none. Very clean specimen; very good brilliant style cut. The specimen is from the series mentioned by Overlin, 2012. Source: John Bradshaw, Coast to Coast Rare Stones International. A late phase in nepheline syenites, syenitic pegmatites, and along the contact zone of a differentiated alkalic massif (Lovozero Massif, Russia) (Anthony et al., 2001—2005). 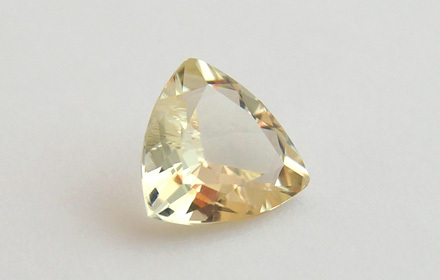 Faceted specimens are extremely rare.